Riesling is a white grape with many names - Weisser Riesling, Rheinriesling, Riesling Renano, and Johannisberg Riesling. Riesling is usually made to be a sweet wine, although it can also create a dry wine as well. In a way, sweet riesling is the 'precusor' to White Zinfandel - Riesling is the wine that "sweet tooth" drinkers sought out before White Zinfandel became available. The Riesling grape is believed to be indigenous to Germany, and has been planted there since the fourteenth century. Riesling does the best in Germany and in California, but is also grown in the Alsace region of France, in Austria, Australia, Canada and New Zealand. Riesling is the most planted grape in the Rhine Valley in Germany, and people who talk about a "Rhine Wine" (that rhymes!!) are talking about a Riesling. Riesling and Rhine Wines were very popular in England in past centuries. In fact in Hamlet, the wine that the Danish court gets drunk with every night is a Rhine Wine! Most German riesling wines are labeled "Kabinet". This is simply the most basic category of wine in Germany, as compared with special types of wine which are harvested late in season to have added sweetness. Riesling is a late-ripening grape, and only has a moderate yield. This makes it difficult to grow, and often the price reflects this. A cheap Riesling might be sharp, but a well grown riesling will be a sweet but complex white wine that ages very well. Riesling is affected by where it is grown - Californian Rieslings tend to be dry and have a melony taste, while Germanic Rieslings are more tart and 'grapefruity'. Other typical Riesling flavors include fruity and floral, as well as honey and musky. Rieslings should be served cool at 47F (but not as cold as fridge temperature). Riesling goes very well with oriental dishes. It also goes well with seafood of all types, and is one of the few wines that goes well with chocolate. It is also great on its own, as a dessert wine. In Ontario, Canada, Riesling is used in the creation of Ice Wines. Note that Riesling does NOT rhyme with Rhine NOR with Wine. The way you pronounce Riesling is Reeee-zling. It is NOT REYE-sling like eyeball. Just like Riedel glassware is Reeeee-dle, like needle, and not Reye-dell like Ridell High in Grease. The reps at Riedel, and they say that's the way the owners pronounce their name. They should know! Plus, in the German and Austrian languages, that is how the letters Rie are pronounced. If the Germans want an "Eye" sound, the spell it Rhei, like in the Rhein River (that's the German spelling of Rhine) and in Rhinegold. Rie = Reeeeeach for the moon. Rhi = REYEball that moon from afar. BelGioioso Crumbly Gorgonzola Cheese is blue-veined with a full, earthy flavor and perfect for everything from salads to stuffing your olives for a dirty martini. Crumbly Gorgonzola Cheese is aged over 90 days. This is a special order item. Please choose a shipping method that will have this to you within two days. Add elegant details to dinner party dishes or add new flavors to any meal with BelGioioso Crumbly Gorgonzola Cheese. With 12/5oz cups of crumbly Gorgonzola cheese, you can add a bold zing and extra richness to appetizers, main courses and even desserts and drinks. Gorgonzola is a bold, full-bodied cheese with a rich aroma and a strong flavor. Stuff a few crumbles into olives to complete the perfect dirty martini, sprinkle a handful over a garden salad to mix crisp and creamy or get the full spectrum of flavors with pears, apples or walnuts on crackers. With Gorgonzola cheese already crumbled, it only takes an instant to sprinkle. 1. 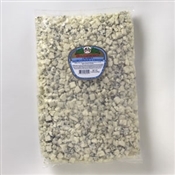 BelGioioso Gorgonzola Cheese creates excellent sauces for chicken, pasta or steak. 2. Melt BelGioioso Gorgonzola Cheese onto a grilled hamburger or chicken sandwich for a savory variation. 3. For a charming and tasty dessert, serve pears, figs and walnuts with BelGioioso Gorgonzola Cheese. 4. Top Italian bread slices with BelGioioso CreamyGorg and fresh pear slices for a tasty appetizer. 5. Cream Gorgonzola Cheese with BelGioioso Mascarpone Cheese, minced garlic and onions. Spread onto pieces of prosciutto ham and roll onto a celery stick for a tasty appetizer. All Wheels ordered by noon on Thursday will be ready for shipment the following Monday. Wheels average 15-17 pounds. BelGioioso Crumbly Gorgonzola Cheese is blue-veined with a full, earthy flavor and perfect for everything from salads to stuffing your olives for a dirty martini. Crumbly Gorgonzola is aged over 90 days. 1. 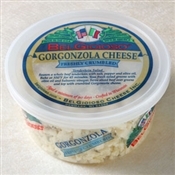 BelGioioso Gorgonzola Cheese creates excellent sauces for chicken,pasta or steak. Both firm and crumbly, this ivory-colored cheese with blue-gray veins has a stronger flavor than our Creamy Gorg Cheese. Crumble into salads and dips or serve with pears,apples and walnuts as an appetizer or dessert. 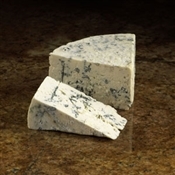 BelGioioso Gorgonzola Cheese creates excellent sauces for chicken, pasta or steak. Melt BelGioioso Gorgonzola Cheese onto a grilled hamburger or chicken sandwich for a savory variation. For a charming and tasty dessert, serve pears, figs and walnuts with BelGioioso Gorgonzola Cheese. Top Italian bread slices with BelGioioso CreamyGorg Cheese and fresh pear slices for a tasty appetizer. Cream Gorgonzola Cheese with BelGioioso Mascarpone, minced garlic and onions. Spread onto pieces of prosciutto ham and roll onto a celery stick for a tasty appetizer. Melt into a pasta with sauted pears and walnuts. Give garden salads a bold flavor, stuff olives to make a rich, elegant martini, or make traditional potato recipes and even desserts unique with crumbly Gorgonzola cheese. BelGioioso uses a careful curing, mixing and aging process to make crumbly Gorgonzola cheese with a sharp, bold taste and a thick, creamy texture. Small holes made during the curing process make the cheese crumbly, so you can easily sprinkle on any dish. 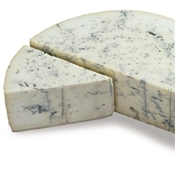 This white cheese marbled with veins of green and blue looks great on a cheese platter and tastes even better with fruit, crackers, walnuts and a deep red wine. Order random weight wedges as gifts or keep in your kitchen to make great recipes exceptional.